Since we’ve been property managers for many years, we know how important selecting the right tenants is to our clients. When we do this incorrectly prospects are not happy, often because it takes too long and we don’t communicate with them. Clients are unhappy, because our process is often not thorough enough. We’ve developed a repeatable process with supporting tools that allow us to complete the task quickly all the while keeping you and the tenant in the loop. If you hire us, your client is sure to like your results! Lead to Lease processing so fast, your new tenant’s head will be swimming! Dramatic cost savings and happy prospects and clients! 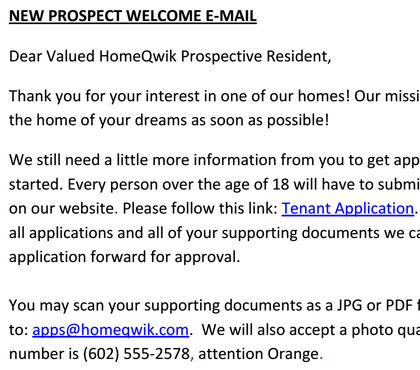 Send welcome e-mail (see thumbnail) to applicants with New Prospect Checklist, Residential Verification Form and Sample Lease Agreement. 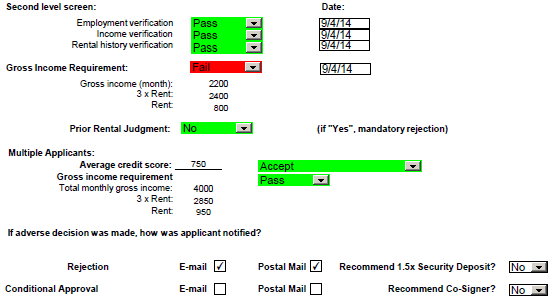 An Applicant Scorecard that shows, at a glance, the status of an individual or household application. This scorecard produces an output based on your screening criteria. 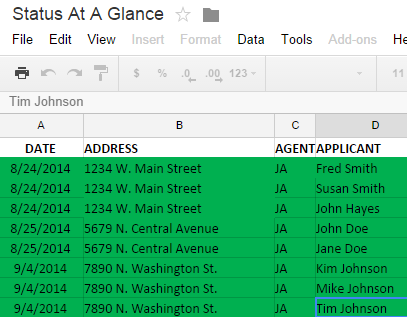 Results and details from your vendor’s Credit and Background Report. Screening Supporting Documents received from prospect: ID, employment verification, income verification, rental history, etc. 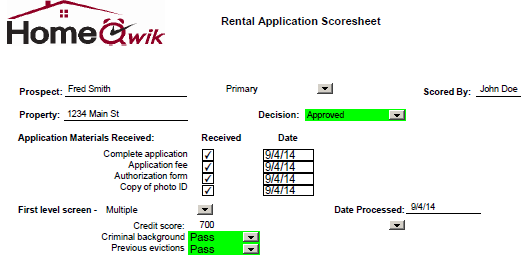 The Result: A complete package of information that allows you and your property managers to make a Yes/No decision on an applicant and determine lease terms.